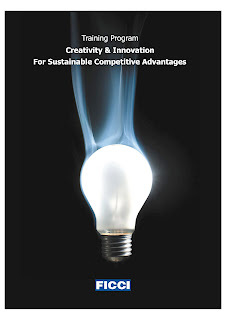 ET and FICCI organised a seminar on Creativity and Innovation called "IDEA CLOCK". The faculty was Pravin Rajpal (Author, Coach and Thought Leader). He has written two excellent books "ACHIEVING BUSINESS EXCELLENCE" and "5 THINKINGS TO WIN"
The workshop started with a 2 minute video clip of JAN GAN MAN tune and it set the tone of the program. That 2 minute clip changed the mood, there was excitement and I just kept all pending issues on back of the the mind and focussed on the presentations and discussed. During next six hours, we got present to ways to be creative and innovative. At 11k+ taxes this was pretty expensive but end result was worth the price. Dr Arun Kumar - Reader, M Com, D Phil at Motilal Nehru Institute of Research & Business Administration, University of Allahabad. All the participants also got a software program called IDEA CLOCK. This is a clock with lot of innovative ideas.